We had a blast while staying in Bear Hugs. It is a beautiful cabin. It had everything you would need during your stay . Put up with brown beetles, stink bugs, carpenter ants and wasps. Called the office and Chasity took immediate action. Called an exterminator & sent a young man to vacuum the bugs up. There is a wasp nest in a tree just off the balcony from the hot tub. If I'd had a pole saw or pole lopper, I would have took care of it. The shower knob is broken and took awhile for us to figure out. Having the hot tub ready and waiting for us was very nice. It would be nice if there were more hangers for the next guest. We still had a blast while staying in Bear Hugs. Now to the only big problem we had for our 8 nights there. The road and the bridge. They are both terrible and frightful. Neither is for the faint of heart and I am. And I have a new 4 wheel drive SUV (Durango). Coming back next year, but we can not stay in Bear Hugs. Hoping to find a cabin with a better road, less grade to it. Thank you again for a wonderful vacation, Denise and Elaine. ALL IN ALL A GREAT STAY AND VALUE. THE FLOODED BRIDGE CAUSED A LITTLE ANXIETY BUT THAT IS OUT OF YOUR CONTROL. THE ONLY THING I WOULD RECOMMEND IN FUTURE DISASTER SITUATIONS IS A CURTESY CALL TO CHECK ON GUEST STRANDED. WE BANDED TOGETHER AND FOUND AN ALTERNATE WAY OUT. The cabin was clean and perfect for our trip! The view was the BEST VIEW I have had yet in a cabin it is in a perfect location being only 5 mins away from Pigeon Forge but was far enough away to feel "secluded" being the cabns where nicest spread apart! Deff wil be using USA Cabins for all my future gatlinburg trips! Can't wait to go back! This is our 4th year staying in Bear Hugs and we love it. We go every year in Oct. I will be booking our next visit soon. The cabin had been upgraded this year with new furnitute inside and outside. We loved sitting on the front deck in the new porch swing and rocking chair. New big screen TV in living room. It was very clean as usual. Wouldn't stay anywhere else. This cabin was so perfect. Location is wonderful. Great views and only 10 minutes outside pigeon forge. The road is steep and I highly recommend driving an SUV or truck but would be doable in a car. The cabin is gorgeous and had everything we needed. All the rooms were a good size, cabin is very well maintained, and it was absolutely beautiful. Probably won't be able to stay here again because we have a growing family (baby slept in his pack and play in our room) but I definitely recommend to couples or families with a baby. We will for sure be using Cabins USA in the future. Loved the easy check in and out process. Paid in advanced and got all the instructions and door code emailed to us so we didn't have to go anywhere to check in and out. If you wanted a cabin in the woods away from the crowds. This cabin is it. We love the floor plan do much we want to build one just like it. Our only negative comment is it is not a quite location. The main road to Townsend is at the bottom of the hill and all the street noise comes straight up. That being said, we will rent again ASAP. Thank you fir a great week. The cabin was beautiful! Great view. The only issues we had was the road up to the cabin we brought our Harley not a very good road to ride a Harley on. Also we had no TV we called and first thing the next morning they fixed it and our door handle broke and they came right away to fix it. Will book from Cabins USA again just a different cabin. Great cabin!! We will defiently be back!!! Loved the hot tub and view was amazing! Me and my husband booked this cabin for our anniversary trip. The location of the cabin was not the best, but the cabin was nice and cozy. It could have been cleaner like the tub and the pillowcase on the bed, it also needed to be dusted. We enjoyed the pool table and the hot tub, the last night of our stay we did experience issues with the lighting in the kitchen, on the back deck and also the light above the pool table they would not turn on!! Overall it was a peaceful stay I will booked with Cabin USA again just not this cabin. The cabin is beautiful and is just as the video shows with the exception of the overgrowth of trees somewhat blocking the view from the deck. The cabin itself could have been a bit cleaner. The floors looked clean, but walking around barefoot, i could feel the dirt and grit from the first day. My socks and feet were always dirty. The base around the floors had an accumulation of dust. The cold air vent needed to be cleaned. The windows although clean on the inside sure needed to be cleaned on the outside. Spider webs and dead bugs are just not what i want to see looking out the windows. I did not ever see a live bug inside the cabin, so that is being well controlled. Cleanliness issues aside, i would book this cabin again. Loved the layout. The stove, fridge and microwave were immaculate. The water was hot when needed and the water pressure was great. The washer and dryer were an awesome benefit. The hot tub was great. A little extra attention to the overgrowth and the cleaning would allow me to give this cabin a perfect 10. Overall, our experience for our mountain getaway was wonderful. Thank You! This is our best cabin rental so far. We loved the beautiful view. We saw two rainbows. We liked everything on one floor. The shower was a little iffy and the couch was very uncomfortable. But the rocking chairs on the deck were great. We will try to stay here again. We were very pleased with our stay. The cabin was clean. We were pleased to see dish soaps, bath soaps, toilet paper and paper towels. We recently stayed with another cabin company and we will never stay with them again, had a partial roll of toilet tissue in one bath and none in the other. But thank you we were very satisfied and will stay with you again. I was nervous because this cabin only had 3 stars when I booked, but I was pleasantly surprised. Very clean and everything was pretty updated. It’s a lot bigger than I thought it was going to be. There’s a pull out couch to sleep more, but you could easily blow up another air mattress in the living room if you wanted. I guess I would have liked if there was another couch or love seat but that’s the only thing I would suggest. View was great! I was also glad I had all wheel drive because the drive up was kind of difficult but overall the cabin wasn’t super hard to find or anything. My GPS got us very close and I was able to figure out the rest. It’s about 5 min from pigeon forge and 20-25 from Gatlinburg which was fine with me. We loved the Bear Hugs Cabin!! It was nice and clean and loved having a pool table and Jacuzzi at our convenience. The views from the porch and inside are Amazing!! Seems like in the future some trees may need to be topped as to not block off your mountains views. There were a few things we would have liked to have such as a bigger TV in the living room(little small), blinds inside facing the side with neighbors as well as an outdoor blind on the opposite side of the Jacuzzi blocking off neighbors sitting right there on their porch. The bottom railing in the middle on the porch is a little wobbly which kinda makes you nervous that high but the place overall was great. Very open with nice hardwood floors. The driveway leading to the cabin is steep and very narrow so be cautious. We were able to make it up in a Lincoln so it is still manageable. It could use some more signs showing which way to go though. It was very convenient to be able to text to check out, being right down the road from the middle of Pigeon Forge with everything to do right there and still having gorgeous mountain views at the same time! We will definitely be back again sometime soon! !Thank you. I loved this cabin. I can't wait to book with you again!! This cabin was in the perfect spot for me and my spouse to enjoy quality time. Make sure you have a 4 wheel drive the way to the cabin is steep. Very clean, however it had a cat odor. The pool table cues tips need repair. The pull out bed mattress/support was degraded. The cabin overall was great, good size, great location. It was very nice we had a great time. the only thing I didn’t like was how close other cabins are. but I would go back again very nice views. The price is very good I will do it again. Some of the kitchen utensils and pans were beat up but they still work. Nothing to keep me from doing it again. Indoor jetted tub was not working and if the button by the toilet is for the jets you should have a sign saying so. A true hot tub would have been icing on the cake for this cabin. It only sleeps 2 “comfortably”. My boyfriend and I really enjoyed this cabin. Fairly easy to get to and we enjoyed that it wasn’t far from the Parkway. Highly recommend you don’t drive a car in the winter. Thankfully we had a 4 wheel drive because it did snow during our stay. The kitchen utensils/cookware were well used and needed to be updated, as well as added on to (i.e., no wine bottle opener, frying pan was no longer round). Other than that, the cabin was clean and comfortable. The maintenance staff, in particular Tony, was wonderful. Highly recommend Bear Hugs. This Cabin was very good. We enjoyed it a lot it had plenty room, very clean and great views off the deck I would recommend it to anybody. I will most likely come again myself. It was our first time in the mountains and the cabin was beautiful, very clean, everything was wonderful and we plan on definitely coming back. I am so happy to hear that everyone enjoyed their stay in Bear Hugs. We here at Cabins USA strive to give each of our guests the best stay possible while vacationing in the Smokies. When you are ready to stay with us again, please mention you are a return guest for an additional discount. Thank you for choosing Cabins USA and we look forward to having you as our guest again soon! Bear Hugs is a absolutely beautiful cabin!!!! It has a very nice, open layout and has a very nice view of some mountains. We enjoyed our time in Pigeon Forge and look forward to returning for a future vacation and staying with cabins USA. Our only problem was the jets in the indoor jacuzzi tub did not work at all and while u could use the outdoor jacuzzi tub, there was a problem with that tub as well. When you tapped water into that tub, there was alot of water leaking creating a waterfall under the porch. Otherwise, we loved the cabin and will recommend anyone to use Cabins USA. Thank you for taking the time to let us know about your recent stay in Bear Hugs! We here at Cabins USA strive to give each of our guests the best stay possible while vacationing in the Smokies. Thank you for letting us know about the jacuzzi and hot tub. Your comments have been forwarded to our maintenance department to be addressed. When you are ready to stay with us again, please mention you are a return guest for an additional discount. Thank you again for your review and thank you for choosing Cabins USA! The trash was left from the previous occupant. The jets in the tub didn't work. And their were two scorpions in the house. We also had a bear. It was cool. He got into the previous occupant's trash. We thoroughly enjoyed our stay at Bear Hugs. It was minutes away from Pigeon Forge without all the traffic. The drive up to our cabin was steep in spots but we always made it safely. The cabin is located between two other cabins on the top of the hill. The view is nice but could have been improved with a few trees getting trimmed. Our cabin was beautiful and comfortable. A few minor repairs and cleaning were needed; the tub on the deck leaked, the cabin floors need a thorough mopping (my toddlers feet were black so we kept socks on her), a few tiles in the kitchen are loose, the toilet could have been scrubbed better and a few light bulbs need changed. We had no hand soap upon arriving (cabin didn't provide it) so we had to rely on our soap we brought. They did, however, provide two boxes of dishwasher soap, a bottle of dish soap and two boxes of detergent. Our pool cube was missing as well and 2/4 of the pool sticks were cracked at the tip. Overall though, we really enjoyed our stay here. The open floor plan was perfect for my daughter to run around in her walker. The staff was friendly and check out was quick. I would gladly stay here again, just hope it's a little cleaner next time. Cabin is great but road leading to it is not. Especially at night or in bad weather. Not easily accessible. I am so happy to hear that you enjoyed your stay in Bear Hugs! We here at Cabins USA work hard to make sure each of our guests have the same great stay you enjoyed while vacationing in the Smokies. When you are ready to stay with us again, please mention you are return guest for an additional discount. Thank you again for your review and thank you for choosing Cabins USA! The Cabin was located with a beautiful mountain view. The drive to the location was very steep. The privacy curtain on the deck was broken with shattered wooden sticks all over. When the wind blew it rattled all night long. The whirlpool tub was leaking and wouldn't hold water. Inside the cabin was perfect. Very clean, with small touches. No instructions on how to start the fireplace leaving it unable to use. This was our first time to the Smokey Mountains and everything was wonderful. Thank you for choosing Cabins USA for your first trip to the Smokies! We here at work hard to make sure each of our guests have the same great stay you enjoyed while on vacation. When you are ready to stay with us again, please mention you are a return guest for an additional discount. Thank you again for your review and thank you for choosing Cabins USA! Everything was awesome. The only trouble we had was climbing that steep dirt road in our non 4X4 SUV. We spun tires several times on the way up. Also, use the directions from registration email...do not attempt to use GPS for this cabin...you will get lost. Thank you for taking the time to let us know about your recent stay in Bear Hugs! We here at Cabins USA work hard to make sure each of our guests have the best stay possible while vacationing in the Smokies. I apologize for any issues you experienced reaching your cabin. Your comments have been forwarded to our reservation department so we can make sure future guests are aware of the drive to the cabin. When you are ready to stay with us again, please mention you are a return guest for an additional discount. Thank you again for your review and thank you for choosing Cabins USA! The cabin was nice and we enjoyed our stay. The view from the porch is amazing and even with other cabins close-by, it was quiet (except for road traffic down below). The express check-in and check-out was great, and this made things very simple. 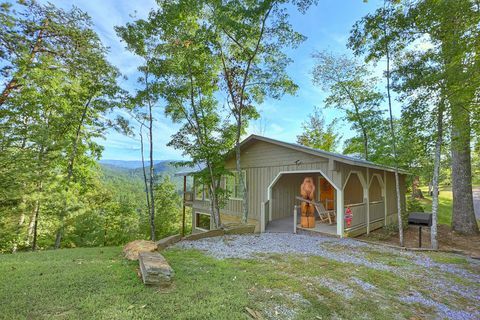 Location is nice and it only takes a few minutes to get to Wears Valley or Pigeon Forge. We didn't realize how steep, narrow, and rough the road going to the cabin would be. There are four cabins at the top and no room for two vehicles when meeting someone. I'm glad we came in a vehicle suited for such and it's the only reason we won't stay at this particular cabin again. A few suggestions: The shower faucet needs replacing and the hot water heater needs to be adjusted. The water was much hotter than it should be. Add blinds to the two side windows at the end of the pool table. These face another cabin and someone from that cabin or anyone driving by can see inside, especially at night when the lights are on. Replace the outside garbage cans with some that have secure lids. An animal got into one and made a mess to clean up. Add more lighting or higher watt bulbs in the kitchen. It was very dim at night when cooking or eating. Correct the address that is listed for the cabin. The website says the cabin is on Hidden Hollow Way, but it is located on Cove Creek Way. Correcting this would be beneficial for guest that use navigation when traveling. This is our 2nd year at Bear Hugs and we will be back next Oct. in the same cabin. It is now our home away from home. We love the location and the view. It is everything we wanted and more. I will be booking our next stay in Jan-Feb for the middle of Oct. Can't wait! This cabin was exactly as described in the details and pictures. We were excited to stay here on our honeymoon and it was perfect for the two of us. The view is wonderful and staff was very friendly. No bad encounters here at all! Will be staying here again. We very much enjoyed our stay in Bears Hug & would like to stay again next year, if a few simple changes can be made at the cabin. Those changes are.....better lighting in the den & kitchen area. LED bulbs will do the trick. Lighting is so poor in the den that when it gets dark you can't see the balls on the pool table well enough to play......and we DO play !!!! I told staff about the faulty valve on the tub/shower. I am certain that will be fixed as well, and the water is scolding hot ( +140 degrees ). That should be adjusted, too. Only real complaint is the traffic noise from below which can't be corrected. Would like to see other I-level cabins available but not so close to noise. Website doesn't seem to let me look for that unless I provide a check-in date. Any help on this ? Next stay will be for 2-weeks. Also, how far in advance can we reserve a cabin? Thank you for taking the time to let us know about your recent stay in Bear Hugs! We here at Cabins USA work hard to make sure each of our guests have the best stay possible while vacationing in the Smokies. Thank you for all of your suggestions; we are continually looking for ways to improve our guests' stay. Your comments have been forwarded to our maintenance department to be addressed. If you are looking specifically for one level cabins, please contact our reservations department. They will be more than happy to help you find the perfect cabin. Thank you again for your review and thank you for choosing Cabins USA! Beautiful cabin and setting! We will be back next year! The cabin was beautiful and we had a fantastic time staying at Bear Hugs. My only recommendation for those considering staying at this cabin is to aware of the drive to the cabin itself. The drive up the side of the mountain was washed out and unpaved. Fortunately we were in a vehicle equipped to handle these conditions, however others may not be so fortunate. Overall, we had a fantastic time. Thank you for taking the time to let us know about your recent stay in Bear Hugs. We here at Cabins USA work hard to make sure each of our guests have the best stay possible while vacationing in the Smokies. Your comments regarding the drive to the cabin have been forwarded to our reservations department so they can make other guests aware. When you are ready to stay with us again, please mention you are a return guest for an additional discount. Thank you again for your review and thank you for choosing Cabins USA! The Cabin was very nice and was clean, including all the appliances! The bathroom was big but the sink was small, it had no room for keeping all your bathroom supplies, so perhaps adding a few shelves would help. My only complaint would have to be lack of supplies, there was very little decent pans, utensils, good cooking supplies, etc. no hairdryer. Other than that the property was very cozy and we enjoyed our stay very much. Thank you! Thank you for all of your kind words! We here at Cabins USA work hard to make sure each of our guests have the same great stay you enjoyed while vacationing in the Smokies. Thank you for letting us know about the lack of pots and pans. your comments have been forwarded to our housekeeping department to be addressed. When you are ready to stay with us again, please mention you are a return guest for an additional discount. Thank you for choosing Cabins USA and we look forward to having you as our guest again! Nice cabin but the gravel road leading up a mountain to the cabin needs to be paved. Could def tear up your car with all the pot holes and all the holes where rain water has moved through the ground. Should make customers who have nice cars aware of this before hand. Also glass on the road near the cabin could have popped a tire. My wife and I just returned from one of the best vacations we have ever had. We stayed at "Bear Hugs" for 4 nights and enjoyed every second of it. The views are breathtaking and the cabin was incredible. The staff at CabinsUSA were extremely welcoming and we have already told our family and friends to use them! We loved it so much that we extended our vacation an extra day. Unfortunately our cabin wasn't available an extra day, however, the staff helped us find yet another GREAT cabin for an amazing price. We are definitely coming back. We are planning for a week in August and this time we'll be bringing the kids. This is definitely a vacation we'll be doing annually. We couldn't say anything negative about our experience at all. Overall, we were extremely satisfied. Can't wait to come back!! Thank you for all of your kind words! We here at Cabins USA work hard to make sure each of our guests have the same great stay you experienced while vacationing in the Smokies. When you are ready to stay with us again, please mention you are a return guest for an additional discount. Thank you for choosing Cabins USA and we look forward to having you as our guest again! We stayed at Bear Hugs for out one year anniversary and could not have picked a better place. The cabin was gorgeous and there is a beautiful view any direction you look. We loved grilling out, playing pool, and sitting on the porch. I loved the bathroom, very cool layout. Everything was clean and comfy! I liked hat we had neighbors but they weren't too close. Nothing bad to say about this property. Checking in and out was very simple as well. We loved our stay at bear hugs! The express check in/out process was a breeze and allowed us to go straight to our cabin. The view is amazing! Our only complaint was that the jacuzzi tub indoors did not work and that the outdoor one leaked but these were so minor we didn't even bother with it. Overall the place was really clean and a great fit for us and our boys. Also if you're planning on grilling you will need a grill brush and some tongs as those aren't provided. My boys are already asking to go back and we've only been back home one day! I am so happy to hear that everyone enjoyed their stay in Bear Hugs! We here at Cabins USA work hard to make sure each of our guests have the same great stay you enjoyed while vacationing in the Smokies. Thank you for letting us know about the jacuzzi tub. Maintenance has been notified and will be correcting that issue. When you are ready to stay with us again, please mention you are a return guest for an additional discount. Thank you again for your review and thank you for choosing Cabins USA! After looking into many of the cabins I settled on Bear Hugs for anniversary getaway and couldn't have been happier. I kept our destination a surprise from my husband until we arrived and he was pleasantly surprised. I would recommend the company to all looking for a pleasant getaway and I will definitely use them again in the future. Our stay was great. Loved the cabin. Great view of the mountain's. I am so happy to hear that you enjoyed your stay in Bear Hugs! When you are ready to stay with us again, please mention you are a return guest for an additional discount. Thank you for choosing Cabins USA and we look forward to having you as our guest again! We just finished a great four night stay at "Bear Hugs". Our trip started out a little bumpy as we fought traffic from I 40 down to the Gatlinburg office to find it closed. A quick call to get the door code and help from the pizza shop guy and all was well. Upon arrival "Bear Hugs" was better than pictured. Cabin was clean and comfy, with large bath and living areas. The views from the balcony overrode the noise from the road below, and hardly any insects encountered. If you plan to stay at Bear Hugs I would recommend a few things. I would study the map, count the curves, as Cove Creek Way can be tricky to find. The mostly gravel road was fairly steep, but we had no trouble in our fully loaded Honda Civic. I would recommend bringing a few things: silverware and tongs and extra pillows and extra tp. The cabin does have satellite tv but no dvd player. The charcoal grill is on it's last legs so keep that in mind. We did hear a critter in the voids around the shower walls but had no encounter and it was reported to the main office. We would stay there again if it only had a hot tub. Loved, loved the cabin. We h a d a wonderful time. Beautifil views. The only thing I would change is a better set of cookware, dishes and silverware. For those of us that like to cook these were not the best, just a personal preference. Otherwise the cabin was absolutely perfect. Looking forward to next trip. We only stayed at the "Bears Hug" Cabin for three nights. The cabin was fairly clean and tidy. The outside Jacuzzi tub was leaking and according to the guest book in the cabin it has been leaking since 2012. We were very comfortable and was disturbed on our last night by a unwelcome guest. We were awaken from our sleep by a critter trying to get into the plastic trash can. I got out of bed to investigate and found out that the noise was caused by a raccoon. I ran him off twice but he was determined to get into the trash. The raccoon chewed up the lid and side of the trash can. I finally had to move the trash can inside to keep him from coming back. We enjoyed our stay and would be willing to return again. We were in ah when we opened the door to Bear Hugs! It was everything the photos portrayed! The view and spacious living, gave us a real Smoky Mountain feel! We turned it into our home for a week and thoroughly enjoyed our stay! We could not get the ice maker to work but a bag of ice resolved that issue. We were very impressed that Maintenance came in the dark of the night our first night to bring us a bar b q grill - he was very hospitable! Cabins USA has a friendly staff, not only on the phone but On-Line Chats! Our experience with the Smoky Mountains was over the top! The excitement of Dollywood, Pigeon Forge, the Island, Gatlinburg, and the thrill of the Tail of the Dragon, were great memories to take with us! Returning to our cabin each night had such a heartwarming feel....the pool table, hot tub on the deck added to our love of the cabin! We will definitely use Cabins USA again! Thank you so much for all of your kind words! Our staff works hard to make sure that each of our guests have the same great experience you enjoyed while vacationing in the Smokies. When you are ready to stay with us again, please let our reservationists know you are a return guest for an additional discount. Thank you again for your review and we look forward to having you as our guest again! We absolutely loved staying at "Bear Hugs"! We were there from 8/10/15 to 8/14/15 (honeymoon) and the pictures online are about the same with just a couple of changes which I will list. Everything else in the pictures are exactly how it is when you arrive. First of all the road leading up to the cabin is partially paved and partially gravel (felt like home because we live on a curvy gravel road) but once you get closer to the cabin it is completely paved. Second, the door entering the cabin is a little tricky so pay close attention to the instructions. Third, the tv in the living room has been replaced with a new flat screen and the bathroom (which online there is no pictures of) has a washer and dryer in one of the closets and it is a large bathroom that can be accessed through the bedroom as well as the living room. Plus, the bathroom has a large whirlpool bathtub in it. The floor to ceiling is all hard wood and is absolutely gorgeous! I think the bed (which is very comfortable too but bring your own pillows; I liked mine better) is either a king size bed or California king so that was amazing too! I looked online for another "open" weekend in September because I want to be able to bring my son next time but its totally booked! I am bummed about that. One thing I must add is the picture on one of the walls is a scenery picture which is beautiful in its self but then, the Bible verse at the bottom (Be still and know that I am God, Psalms 46:10) just made it that much better! I wish there was a way to add pictures to this review because I would show the bathroom pics I have. Location is marvelous because its only minutes away from shopping etc. but private as well. I know that from now on I will only stay at Bear Hugs when I visit Pigeon Forge again! Thanks Cabins USA for our wonderful honeymoon! Thank you for all of your kind words and I am so happy to hear that you enjoyed staying in Bear Hugs! We here at Cabins USA work hard to make sure that each of our guests have the same great stay you experienced while vacationing in the Smokies. When you are ready to stay with us again, please let our reservationists know you are a return guest for an additional discount. Thank you again for your review and we look forward to having you as our guest again! This was the most beautiful & cleanest place I've ever stayed. The pictures of the cabin you've posted are exactly how it looks. There's no picture of the bathroom (it's huge w/ another jacuzzi tub). The location was perfect on top of a mountain away from crowded areas but not to far from everything. Thank you for a wonderful week. We will be back. Thank you for all of your kind words! We here at Cabins USA work hard to make sure that each of our guests have the same wonderful experience you did while vacationing in the Smokies. When you are ready to stay with us again, please let our reservationists know you are a return guest for an additional discount. Thank you again for your review and we look forward to having you as our guest again! CABIN WAS VERY NICE. HEARD A "CRITTER" ABOVE THE CEILING IN THE BATHROOM AREA. COULD USE LUGGAGE RACKS FOR SUITCASES. Thank you for your kind review! We here at Cabins USA work hard to make sure that each of our guests have the same great stay that you did. I will forward your suggestion about the luggage racks on to our owner's account department. Thank you for choosing Cabins USA and we look forward to having you as our guest again! We enjoyed our time at the cabin. It was peaceful and quite. We would like to visit and rent the same cabin again. Nice cabin and pretty clean compared to most. Noticeable dust on the floor behind the tv stand in the bedroom. The shower curtain in the bathroom had some mildew and some shampoo from a previous guest... Otherwise the bathroom was very clean. The furniture is a little dated and the bed is not the most comfortable. The location is beautiful, but you can hear the traffic from Wears Valley Road, as you're overlooking that area. Very cute and cozy cabin though. Had a nice stay. Thank you for your review Lyndsey. We apologize if you were inconvenienced at all. Cabins USA always strives to uphold high standard of cleanliness. We will have our inspector immediately look into the issues addressed. We are delighted you had a nice stay with us, and we hope to hear from you again for your next Smoky Mountain vacation. Very relaxing location but still close to everything. The inside was spotless, outside could use a little work. Thank you for your review. We appreciate all your feedback. We will have the outside of the cabin inspected immediately. We are glad you had a good stay and we hope to hear from you again soon. The cabin is great, clean and comfortable. The only thing we didn't care for was the road to the cabin. Needs some attention. Would probably stay there again. Thank you for your review. We are glad you had a great stay with us at Bear Hugs. The road leading to the cabin is gravel up until you reach the cabin. We apologize if this was inconvenienced you in any way. We do have some cabins that are off gravel roads but many others that are on paved roads. We appreciate your feedback and we hope to hear from you again soon. My reason for chooesing sevens for cleanliness, amenities and comfort are because the kitchen oven had not been cleaned and also there were hair on the sofa and bed as well as the cabin had no heat other than those few issues being at the cabin was a great expernuce. The cabin was beautiful and I can't wait to go back. Thank you for your review Koisha. We apologize regarding the issues that you encountered during your stay. We do ask that you call us regarding any issues that you are experiencing, because we do have maintenance on staff to respond to any issues that you may come across during you stay. We look forward to hearing from you soon. Just wish there had been a real hot tub and not just a tub outside on the porch. Thank you for choosing Cabins USA. Bear Hugs is an amazing cabin with a beautiful view, but it does just offer the jacuzzi tub on the back deck. We hope that you will choose to call Cabins USA for your future vacations to the Smokies. My husband and I celebrated our 1st wedding anniversary and New Years at Bear Hugs. The views were great. The cabin was clean and comfortable. We were glad we had our 4 wheel drive vehicle to get back and forth to the cabin during times of some snow and ice. We had a wonderful visit and hope to come back with our family. We really enjoyed our stay at this cabin... Very clean and cozy for our weekend getaway.. Will return again soon.. Loved everything except there was no hot tub. Brochure said hot tub. That's a jacuzzi on the deck, not a hot tub. Cabin was beautiful we enjoyed our stay looking forward to coming back up a staying with ya"ll again. using your web-site, checking in & out - all pretty easy & seemless. The property was very nice. really liked the looks, the view, etc. Limited seating choices (couch, kitchen chairs or 1 recliner) but they were OK. Things like pool table were well used, but we still played it. A/C was nice. The gas grill igniter didn't work, but we were able to use it by using matches. The only issue we had were the bugs. Found a few scorpions and tons of gnats or fruit flies or something of that nature. When I called, staff said 'it is a cabin" and "they only sting like a bee" (which I am allergic to). We have stayed in 2 other cabins & camped over the years in the Smokies. We didn't encounter this before. Anyway, they had pest control come out & the day after we got there. By the last day we were there the dead gnats subsided - we had been sweeping them up 2 or 3 times a day. And a day or so after the pest control came we quit finding scorpions. All in all, we did enjoy the trip and the property. Thank you for choosing Cabins USA. We are happy that you were able to enjoy the beauty of the cabin Bear Hugs. We apologize for the inconveniences that you encountered during your stay. We are happy Orkin was able to come out and take care of the situation, but we apologize for the after effect. We hope that you will give us a second chance in the future. We offer our return guests an additional 5% off. Thank you for choosing Cabins USA. We are glad to hear you enjoyed your stay with us at Bear Hugs. We hope that you will keep us in mind when you are planning your next trip to the Smokies. Beautiful cabin, lovely location. Seriously, the only complaint is that the king size bed probably needs a new mattress and the "hot tub" is NOT a hot tub, it's a Jacuzzi bathtub on the deck. This was THE best cabin we've stayed in so far. We've rented many times from you and the next time we do I told my husband we are staying at least a week in this cabin. We couldn't believe our eyes when we drove up to it but when we walked inside we were speechless!!! Thank you for making our vacation so wonderful. Thank you so much for choosing Cabins USA, LLC for your vacation getaway. We are so glad to see that you enjoyed your stay and we look forward to hearing from you soon. When returning to our company for another vacation please feel free to call us at 1-800-533-4121 for an extra discount on your stay. Thank you for your time and efforts in Cabins USA, LLC. I hope you have a wonderful day. We loved the view, cabin was beautiful, spacious, and very nicely decorated. Sofa not very comfortable. The plastic mattress cover needs to be replaced with one that is fabric. Everything else was great. Loved the pool table. i was disappointed in the old tvs, the jacuzzi tub on the porch that takes 150 gallons but the water heater is only 50 gallons. The bed was comfortable except for the mattress cover that was too large and wrinkled and the sheets wouldn't stay on the corners. I also would have expected a higher quality of towels for a vacation spot. We truly enjoyed the cabin over looking the valley and such a scenic view. Thank you for choosing Cabins USA. We are happy that we provided you with a beautiful view at Bear Hugs. We hope to see you again soon on your next visit to the Smokies.